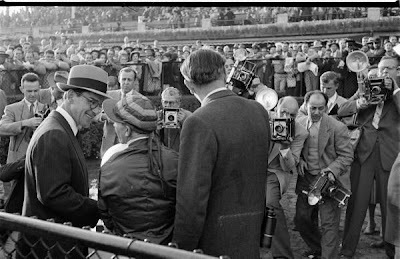 With the invasion of the European steeds into Santa Anita for this year’s Breeders Cup, I though it might be interesting to take a look at the history of international racing on American soil over the next few weeks. Today, we take the idea of shipping horses across oceans and continents for granted. In 1952, the Bloodhorse headline after the inaugural Washington D.C. International read: “Laurel Brings off the Impossible – a Successful International Race.” Impossible indeed, twenty-five years after Charles Lindberg made his historic flight across the Atlantic, horses were being flown across the ocean to compete for a $50,000 purse in a small Maryland town. The first international race of significance in the U.S. took place in 1923 when the Kentucky Derby champ Zev beat the English Derby winner Papyrus in the First International at Belmont Park. Different styles of racing and the obvious limitations of shipping horses by boat, dashed any hopes that such match-ups would become commonplace. Before the Second World War, instances of shipping horses into the U.S. to race were few and far between. It was only after the war that shipping horses by air became feasible and accepted by horsemen who had owners willing to foot the bill. The second development that made international racing possible was the adoption of flat turf racing in America. While many tracks in the United States had steeplechase courses, few had flat turf courses before 1950 (Hialeah being the notable exception). According to Sports Illustrated, in 1952 only 12 stakes in the country were run over flat turf and most of them were established after 1945. In 1947, Jim Butler of the Empire City Racing Association created the Empire City Gold Cup in New York and openly campaigned European owners to send their horses to compete. 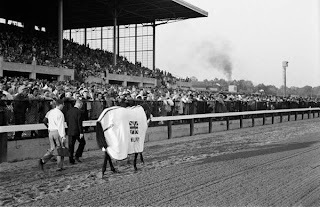 Being run over a dirt surface, very few international horses showed up, and the race disappeared after its 1952 running. Bringing high-class competition from overseas onto American soil required compromises, an acceptable surface, and a track owner willing to make an investment in the idea. John Shapiro, owner of Laurel Racetrack, put all the pieces together and made international racing in the United States a reality. “New York tried the same sort of International Cup Race a few years back, for a $50,000 added purse too, and gave it up after a couple of dismal attempts at Jim Butler’s track. The fields were skimpy, the European breeders didn’t respond much, and neither did the customers, and mostly the competition for the United States steeds came from South America. “…The chief rub could be the absence of the top American stars like Blue Man, or Counterpoint or Sparton Valor who might decline the issue against the invading big shots, because the race will be run on the turf, not the dirt track of America. There are American turf runners, but they are the likes of Pilaster and Vulcanic, solid horses but hardly associated with standouts in the public mind. Shapiro drew a field from England, Canada, and Germany with three entries from the United States. American runner Greek Ship, ridden by Eddie Arcaro, was sent off as the favorite but the race was won by an English colt, Wilwyn, owned by British bookmaker George Rolls. 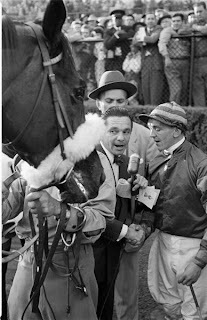 The International did become a ‘turf fixture’ and arguably became one of the most significant races on the American racing calendar. The final running of the International took place in 1994. By that time, it had lost it’s stature as the Breeder’s Cup became the late season destination for the best of the breed starting in the 1980s. The D.C. International is widely considered the first successful venture in hosting high class international thoroughbred racing in the United States. The International laid the foundation for the United Nations Handicap, the Arlington Million, and the Breeder’s Cup turf races — all races that have historically drawn horses from overseas to compete in America. An esteemed group of panelists assembled by the Bloodhorse made the first D.C. International number seventeen in their list of Horse Racing’s Top 100 Moments. One of the great international performances in N. America was Phar Lap's win in the prestigious Agua Caliente Handicap in Tijuana, Baja, California, in 1932. Shipped by boat. Wonderful. One of the things European racing did well and that was reflected in the areas of racing safety of that era. On the other hand in the modern era we continue to discount the increased dangers and allow horses continue to crash into each other coming out of the starting gates. Then after a breakdown we wonder if it was the surface. Hey, perhaps it was the flat tire getting out of the driveway. Another solidly done piece, Mr. CG. Very interesting; I never realized how little flat turf racing there was in the US before the more modern era. Looking forward to next week – I think Zev is long overdue for a retrospective! Wilwyn was owned by Robert C. Boucher, a fruit farmer from Kent, England. George Rolls owned the other English runner, Zucchero, who finished third. was there an irish runner in the 1952 larel park international? Clearly, John Shapiro deserves to be remembered with a stakes race in his honor. I’m not currently aware of any such race that honors him and it seems that Laurel should get on the ball and do so at the first opportunity. And if I’m mistaken, I apologize. For that matter, there should be a race run at Saratoga that memorializes the fact that without the contributions of Gov. Averill Harriman that oval might have gone the way of the Grand Union Hotel in the 1950s. Memories tend to be too short.